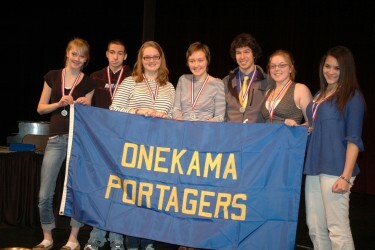 The Onekama Portager Quiz Bowl team came so close to capturing the Class D championship of the West Shore Community College Quiz Bowl competition that they could almost feel the championship trophy in their hands. It still was an outstanding effort by coach Kathy Joseph’s Onekama team who came in as the 2012 runner-up. The 25th Annual West Shore Tournament proved to be one of the best ever, as most matches were very competitive. Many matches went right down to the final seconds before being decided. Onekama’s team consisted of Emily Barnard, Elizabeth Bergren, Curtis McKenney, Clarie Harvey and alternates Alex Barto, Dan Kinn, Kayla Feil and Katie Harrison. They set the mood for the day in their opening-round match where they pitched Mason County Eastern a 135-0 shutout. The Portagers then had to patiently wait to see who would come out on top of the Brethren and Walkerville match. Coach Mike Jura’s Bobcats were right in the thick of it, and time just ran out on them in a 30-25 loss. This year’s Bobcat team consisted of seniors Aaron Hillsamer (captain), Danielle Brenner, Dylan Richardson, Cameron Smith, Brendan Wayward, juniors Joe Riggs, Alex Marsh and sophomores Moriah Miltgen and Lucas Richardson. Onekama then continued to gain momentum when they defeated Walkerville 135-10. The Portagers had rolled up an amazing 270-10 advantage over their opponents at that point in time, and appeared to be on their way to the championship. Things looked even brighter for the Portagers when they squared off against fellow undefeated Pentwater for what would prove to be the first of three matches between the two schools. Pentwater had defeated Manistee Catholic Central 65-45, and Bear Lake 40-10 to reach that stage. However, the Portagers were able to ring the bell on them, and move into the championship round with a 100-70 victory. At that point in time, the Portagers had to wait and see who they would be meeting in that championship round. Manistee Catholic Central which is coached by Matt LaMore tried to bounce back from that opening loss to Pentwater when they met up with Walkerville in their second match. The Sabers team consisted of Gabe Toczynski, Jaime Sierra, Jarred Janicki, Kimmy Patulski, Mike Drew, Logan Hansen, Makayla Sanchez, Chris Buswinka and Jeremy Bigalke. In what proved to be a very close match that went down to the final seconds, Walkerville was able to hang on for a 55-45 win. That loss sent the Sabers out of the tournament. Brethren, who had lost its opening match to the same Walkerville team, then came back in its second match to blank Mason County Eastern 145-0. That paired them up against the Bear Lake Lakers in their next match. Bear Lake was coached by Lavon Jonson and were seeking their first ever championship since the Class D Division was added in 1997. Team members include Jaimey Ferguson, Samantha Mullet, Alex Dutton, Josh Ide, Tyler Groenwald, Miranda Hengy, Katelyn Adams, Emileigh Ferguson and Madeleine Smeltzer. The Lakers were turned back by the Bobcats, 100-30, in the first of several strong matches for the Brethren team. Brethren then sent Walkerville from further action with an 80-15 win. That put them up against Pentwater to see who would challenge Onekama in the finals for the championship. However, the Bobcats’ tournament run ended at that point, and it was Pentwater and Onekama battling it out for the trophy. The first game couldn’t have been closer and Onekama lost a heartbreaking 85-80 decision. Pentwater jumped on that momentum and bounced back for the championship with a 95-50 win in the finals. Students are challenged with some difficult questions in math, science, geography, literature and language, current events, history and theater in Quiz Bowl. The Manistee, Mason Lake and Oceana intermediate school districts help put on this annual event. Staff members from the college also volunteer their time to serve as moderators, judges and timekeepers. The WSCC foundation provides a $500 scholarship to attend the college for a high school senior on the winning Class B/C and Class D Quiz Bowl team. Last week, the Ludington Orioles defeated Manistee High School in the finals to win that round of the tournament.